Grand Master T. T. Liang’s T’ai-Chi Dance – performed by Master Ray Hayward and Sifu Paul Abdela. 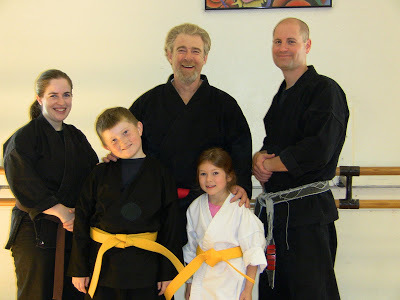 Two students were promoted to Yellow Belt on Saturday. SK showing the stretch that she has been working on. She was promoted to Yellow Belt this past Saturday. This is a link to my teacher Master Haywards YouTube Channel (thanks Read). There are some really great, very educational video clips here. Good quality video and excellent content. Enjoy!! Looking for a few new students to share this marvelous health maintenance art with. Enjoy robust health, inner peace and confidence through the daily practice of T’ai Chi Ch’uan in a friendly, supportive and peaceful atmosphere. A: Flu is a disease caused by the influenza virus. Humans, pigs, birds, and other animals all can be infected by influenza viruses. Typically, influenza viruses can infect only one species, so the influenza viruses of humans are different from those of pigs and birds. However, pigs sometimes can be infected not only with pig influenza viruses, but also with human and bird influenza viruses. Then these viruses can swap genes, creating new viruses that have a mix of genes—from human, pig, and bird viruses. That is what has happened with this new swine flu virus, which contains some genes from human, swine, and bird influenza viruses. Q: Are swine flu or bird flu viruses dangerous? A: When swine flu or bird flu viruses develop the ability to spread from human to human, they can be very dangerous: they can cause a pandemic, and they can produce severe disease. One reason that pandemic illness often is more severe than the regular winter flu is that the virus is so new. The regular winter flu viruses that circulate each year are human influenza viruses and are similar to the viruses that have caused the flu in years past. As a result, most people have some degree of immunity to the latest regular human flu virus. The unusual swine flu or bird flu viruses that develop the ability for person-to-person spread are so different from regular human flu viruses that many people have little or no immunity to them. That is what experts think has happened with the new swine flu H1N1 virus. Q: How contagious will this virus be? A: So far, this virus appears to be somewhat more contagious than the usual seasonal human flu virus. About a quarter of people who have had close exposure to someone with swine flu have gotten the virus. However, all flu viruses love cold weather: cold, dry air makes flu viruses both more contagious, and more likely to cause serious illness. Q: How serious is the illness caused by this virus? A: The normal winter flu kills about one out of 1,000 people who are infected with the virus. In the United States, that amounts to about 35,000 people every year. Early estimates indicate that the new swine flu virus may kill about two out of 1,000 people, about twice as many as normal seasonal flu. However, there is reason to believe that it could cause more severe disease in the late fall and winter of 2009–2010. Q: How do I know if I’ve caught swine flu? A: The initial symptoms of this flu virus are like those of the regular flu: fever, muscle aches, runny nose, and sore throat. Nausea, vomiting, and diarrhea may be more common with this swine flu than with the regular flu. If this epidemic hits your community and you develop flu-like symptoms, it is likely your doctor will take samples from your throat or material you cough up for testing. Wash your hands or use alcohol-based hand cleaners frequently. For a thorough hand washing, use soap, and scrub all parts of your hands, front and back, and between, for about 20 seconds (about as long as it takes to sing “Happy Birthday”). Don’t touch your hands to any part of your face: if the virus is on your hands, it can spread to your throat and lungs from your nose and mouth, or even your eyes. Avoid contact with people who are sneezing or coughing. To the extent you can do so, avoid crowded situations. Stay at least three feet away from others. On a bus, don’t hold on to an overhead strap or to a pole. Instead, wrap your arm around the pole to support yourself. When climbing stairs, don’t hold on to the railing unless you absolutely have to. Q: How do I protect others if I get sick? At home, try to stay away from others as much as possible. If you can, try to stay in one room and have others avoid that room. If you have multiple bathrooms, claim one as your own and don’t share it with others. If you are coughing and sneezing, don’t sneeze into your hands. Instead use tissue and deposit the tissue in a wastebasket or toilet. Wash your hands immediately after. Don’t shake hands with people, or kiss hello. If you have to go out, avoid crowded situations—public transportation, movie theaters, and the like. Q: How long are people contagious? A: Adults should be considered contagious until at least 7 days after the start of symptoms; with children, it may be 10 to 14 days. Q: I hear the virus seems to be losing its punch. Is that true? A: Probably not. The virus did seem to produce more severe disease in Mexico than in the United States and most other parts of the world. But that could be because the weather was getting warmer, and because people in Mexico—not knowing the danger—waited longer to seek medical help. As explained earlier, many experts worry that the virus could produce more severe disease as it spreads in the cold, dry air of fall and winter. That has happened with past pandemics: a summer reprieve was followed by a major outbreak in the fall and winter. Also, influenza viruses change their genes so frequently that epidemics caused by influenza viruses can change their character quickly. The genetic changes could make the virus cause either more or less serious illness. Q: Are there vaccines to prevent swine flu? Household contacts and caregivers for children younger than 6 months of age because younger infants are at higher risk of influenza-related complications and cannot be vaccinated. Vaccination of those in close contact with infants less than 6 months old might help protect infants by “cocooning” them from the virus. Children 5 through 18 years of age who have chronic medical conditions, because they are at higher risk of complications. Once these people have been vaccinated, then everyone from the ages of 25 through 64 years can begin to be vaccinated. Research shows that the risk for infection among persons age 65 or older is less than the risk for younger age groups, probably because healthy people in this age group are more likely to have some degree of immunity against the virus. Q: Can you get swine flu from eating pork? A: Absolutely not. But, as you probably know, you need to cook pork thoroughly to avoid getting other illnesses that can be spread by undercooked meat.For more information on swine flu and influenza, go to Harvard Medical School’s Flu Resource Center at www.health.harvard.edu/flu. Reprinted from Swine flu: How to understand your risk and protect your health, a Special Health Report from Harvard Medical School, © 2009 by Harvard University. All rights reserved. This is the first YouTube video clip that I have been able to upload from my new Cannon HD video camera. It’s an experiment with titles and a sound track. The sound track is way longer than the video track….and I could not figure out how to edit the sound track to be the same length… Please bear with me as I work out the details. This is a method that Sifu has developed to teach young Karate-do students how to correctly tie a Karate (or Arnis) belt. This method allows the young student to see the belt being tied and also to participate in the tying. Encourage the student to participate and tell them when it’s being tied correctly. Lesson 1:The main goal in teaching is always the same……..the student learns to become independent of the teacher!